Nowadays internet threats are increasing day by day. It’s essential for us to have a good internet security solution to defend against viruses, malwares, spywares, worms, etc. The software that comes to my mind is Kaspersky, I guess I don’t need to speak much about Kaspersky, we all know it very well. 1. Firstly, Subscribe to BizzNtech Email updates by clicking here. You’ll arrive at a new page where you’ll have to enter your email ID. Fill in the boxes as shown above. Once done click on “Complete subscription request”. A new page will open saying that your request has been accepted. 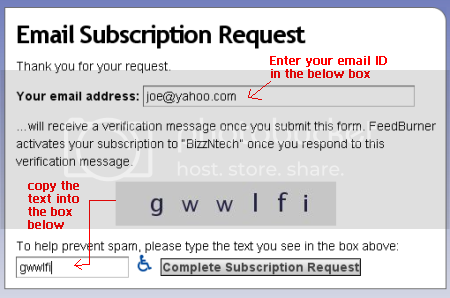 An email will arrive with the subject “Activate your email subscription to BizzNtech” at the email ID provided by you, open it and you’ll and find a link. Click on it to activate your subscription. If you got it right, you should see a message that says Email Subscription Confirmed! in your web browser. 2. Write a short comment in this post stating your opinion about it. Commenting is a must or else you won’t be entitled to participate in the contest. 1. A random list of the contestants will be created here. First 5 names to appear in the list will be selected as winners. Each winner will get one 1 year KIS 2009 license. 2. Make sure you give your correct email ID while commenting here and while subscribing to updates, as this will be the way we will be contacting you. NOTE: I have noticed that people are subscribing to email updates but aren’t commenting here. If you just subscribe to email updates and don’t comment here then you won’t be entitled to participate in the contest. 4. This contest only provides the license and not the software, hence the winners will have to download the software from Kaspersky and then apply the license. 5. The license can be used for 1 year and only for Kaspersky Internet Security 2009. 6. The contest ends on 11/07/08, No entries will be accepted after 11/07/08. 7. Winner will be announced on 13/07/08.